As an aside, Bridge from Below is one of the main reasons that some people joked about Future Sight being a secret Un-set when it first came out – it does absolutely nothing if you have it in play (other than things like add one to the count of cards like Yavimaya Enchantress or Sphere of Safety). To be fair, it also has an unusual mana cost which can help you when you’re playing Mental Magic, as it can become Necropotence or Infernal Contract if you need it to. I’m not sure you would ever see it on the stack unless that was the scenario. In addition to the high-end and very extreme ways to exploit it that James’ section of this page explains in full, it obviously interacts with any card that allows you to sacrifice things, and can be a simple attrition tool for when your creatures die, although it’s both slow and fragile in that latter context. It has a lot of build-around potential which requires a rather focused deck, so it may not be as interesting in more open and less competitive contexts as some cards are, but it’s worth remembering as it has a truly unique effect. And now for the card you never want to cast. Make no mistake, Bridge from Below is completely useless while its sitting on the board; its strength lies in its triggered ability, which triggers while it’s languishing in your graveyard. Good thing you’re in black, right? So, Bridge from Below is a simple effect in theory, though the execution is where it gets fiddly. 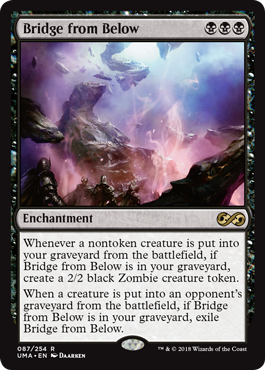 Whenever one of your nontoken creatures meets with an unfortunate death experience, you get a Zombie…but when one of your opponents loses a creature, the Bridge bids a fond farewell. These effects stack, though; if you have four copies of Bridge from Below, you get four Zombies on a creature dying. Get a card with dredge into your graveyard, such as Golgari Grave-Troll, and start loading up your graveyard with cards. Use Street Wraith to cycle and start dredging, for example. Eventually, you’re going to hit Bridge from Below…and Narcomoeba, the latter of which will come into play immediately. You also have the option of using Nether Shadow, Ichorid, and maybe Nether Traitor too I guess. Point is the same: get warm bodies. At some point, you’re also going to mill away a copy of Dread Return and a copy of a creature like Flame-Kin Zealot. This is the important part to the combo. Activate Dread Return by paying its flashback cost, sacrificing three creatures and targeting Flame-Kin Zealot. Bride from Below will trigger; if you have four copies in the graveyard, you get 12 Zombies just from casting Dread Return. Return Flame-Kin Zealot to play and swing with your hasty army of undead abominations. As far as decks go, the strategy is famous for being fragile and prone to disruption, as well as being weak to graveyard hate. But Dredge is infamous for being able to pop off with little warning, and Bridge from Below is what enables Legacy Dredge to be a Thing. (Dread Return’s ban in Modern means the Bridge has a harder time getting going, but who cares?) It’s a unique card with a clear home, but getting it to work can be a challenge outside of a specifically optimized shell.